Insulated earth walls range from 400mm to 450mm thick. They can be built with a either 50mm, 75mm or 100mm Styrofoam core in the middle of the wall that achieve up to an R-value of 4.3. Insulted rammed Earth walls are great for areas of a house that get shading in winter, for more extreme winter conditions a 450mm thick wall is the way to go. Our insulated system can feature no thermal bridging around windows and insulated lintels. Standard rammed earth walls are generally 300mm thick, providing great thermal mass used for both internal and external walls. They have great soundproofing quality and work great in areas that get sun all year round. 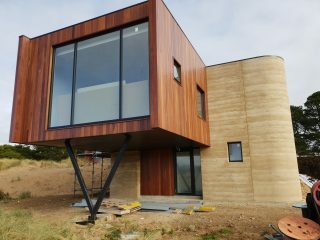 We are currently building a two story rammed earth house at Scamander, which is all non insulated 300mm thick rammed earth walls and has achieved a 6 star rating.